The Guy nixed half the bedroom inspiration. I had done all the prep work, all he had to do was tell me which of the three options he liked the most. I don't think he quite understood his role in the mission to redo the master bedroom/bath. Or maybe he decided "master" meant he was in charge of decorating decisions? I don't know, but he took one look at the George Nelson sconces and said "Huh? Yeah. NO"! A totally visceral reaction that was so loud he had the sales guy and two customers chuckling away. I was unamused. He then showed zero enthusiasm for any of the gorgeous walnut beds I'd been lusting after and eventually, after looking at and lying on a zillion beds in a few thousand stores (ok I exaggerate but it was a long day) he pointed at one across a room and said "That one". "That one", the Hoffman at Room and Board, appeared to be everything he always said he hated about furniture - especially bedroom furniture. Firstly it was upholstered - he has allergies and we have a bunch of kitties that leave fur everywhere. Wooden and leather furniture you can wipe down with a cloth but fabric? All traces of dust or kitty have to be removed with a vacuum or roller-ball. Every. Single. Day. Then there's the style - it has buttons. The Guy hates trim of any kind and that includes buttons. I decided he was so hungry he must be hallucinating so I dragged him off to Mercer Kitchen for some lunch, where, I swear, he spent 90 minutes talking about the damn bed. I have to admit his reasoning was good - there was already a lot of wood in the room and sitting up to read in bed would be more comfortable. We went back after lunch to see if his feeling for the bed was true love or a mere infatuation. The temptress had more tricks in store - we he could choose the upholstery, including the retro inspired fabric above and the legs and it fitted with the Grove night tables, a pick of mine that he likes. When he found a mattress that felt like his beloved Swissflex he was sold; apparently he has never felt like this before. Not even the salesman's remark that Long Island is a unique animal and we'd have to pay extra shipping to have it delivered to the Incorporated Village deterred him. He has to have this bed. Is this a mid-life crisis? Should I be worried? Designing by committee (ie any other opinion than your own) can be tricky. 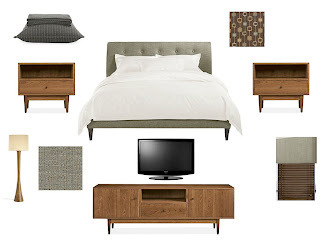 I love your design board-- esp those end tables--and the guy has plans to spend more time in bed-- a decision I support. (sotto voce)"it's a bed. i am tired. i am going bed blind. if i make a decision - irrespective of whether it is the correct one - the pain will stop". (marcato)"that one"
I suppose you have a theory why he spent lunch rhapsodising about "that one"? You are so funny. Is The Guy going to vacuum that upholstered bed daily, or are allergy medicines in his future? 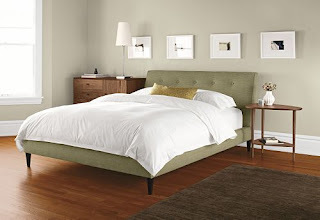 We have an upholstered headboard, but want to replace it with wood. Our cats think it is a scratching post. How do you make those design boards? You misunderstand the focus of a man's midlife crisis. As near as one can tell from the Blog - The Guy has not gone out and bought a red sports car. He has directed his attention to the home fires in the bedroom and, with that in mind, wants an upholstered bed to muffle sound!! He doesn't care about pets - be they dogs, cats or rabbits - his only concern is your pleasure!! This is almost as good as Mike calling me from a *yard sale* this weekend (!!!) to tell me he found a *church pew* he thought I would like (!!!!). Maybe there was something in the air? Some sort of "unique animal" in and of itself for sure. I love the R&B bed. Kitty hair be damned. The whole look is sweet (suite?). It may be time to throw in a negotiating nugget - trade for a guys weekend w/the boys? Great post!!! And thx for joining the HOMEdigz party!